. . . and a chance to a) save the $400 Billion that goes overseas every year for oil, b) generate jobs from Americans creating American energy, c) birth new, innovative industries at home, d) reduce the economic and political clout of Arab dictatorships and support Israel and e) become energy independent and energy secure and bring back the indomitable spirit that is America! A National Student Competition: In addition to the competition amongst all of America's cities, The National Forensic League and Words That Shook The World bring all of America’s high schools into the effort to educate and inspire. 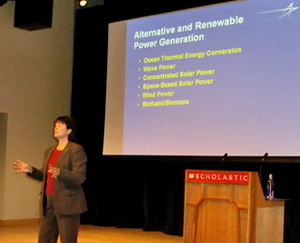 Students across the country will compete by uploading 3 minute videos on either "Why America Needs to Be Energy Independent", or "How America Can Become Energy Independent by 2020". The best videos would be included in the television reality show or featured by their local NBC affiliates, and the top 10 are flown to Washington, DC for the Finals of the competition in front of U.S. Senators, Congressperson and energy independence and national security experts, covered by NBC and The Today Show. 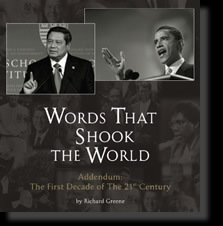 Beverly Hills Communication Strategist and speech advisor, Richard Greene was Indonesian President Yudhoyono's special guest at the State Dinner in Jakarta for President and Mrs. Obama in November, 2010 and was invited to surprise the American president with his new book designating both leaders as the speakers of the two most significant speeches of the 1st decade of The 21st Century. 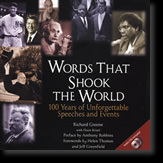 "Words That Shook The World: The 1st Decade of The 21st Century" is the continuation of Greene's prestigious "Words That Shook The World: 100 Years of Unforgettable Speeches and Events", published by Prentice Hall in 2002 and used in high schools and universities as one of the most prestigious works on great speeches. Greene chose state senator Obama's 2004 Democratic National Convention Keynote, claiming it to be "the most successful political speech in American history" and President Yudhoyono's 2009 Harvard Address, "Towards Harmony Among Civilizations", a stunning call for moderation in the Muslim world as the two speeches and two personalities that shook the world in the past decade. 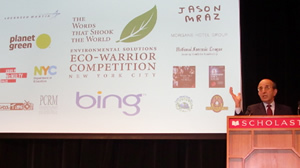 Words That Shook The World has donated over $11 Million of educational videos to every high school teacher and every high school student in The New York City Schools. These are not only "The 5 Secrets" of President Obama, but the communication secrets of Ronald Reagan, Martin Luther King, John F. Kennedy, Winston Churchill, Franklin Roosevelt and the others in "Words That Shook The World: 100 Years of Unforgettable Speeches and Events". UPLOADED VIDEOS OF TOP 5 STUDENTS IN 2008 COMPETITION. 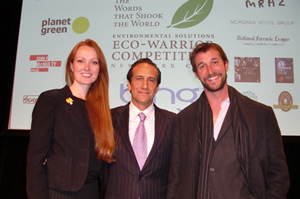 Here are THE RESULTS for the 2nd National "Words That Shook The World" Public Speaking Competition!!! EVERY high school student in The New York City School System is invited to "Shake The World" with THEIR words and have the chance to win some of the $42,000 in scholarships . 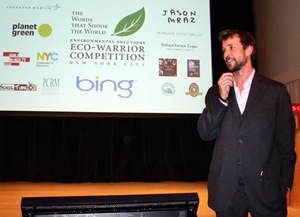 . . and help the City of New York, America and The World in "The Environmental Solutions" Competitions. Students are invited to serve their city, country and the planet by coming up with environmental projects, innovations or even inventions concerning Technology, and the new environmental focus that looks on the interrelationship between "Eating, Health and The Environment". The student will then tell us all about them in a compelling 2 - 3 minute video which will be uploaded on SchoolTube and judged by The National Forensics League and our sponsors. 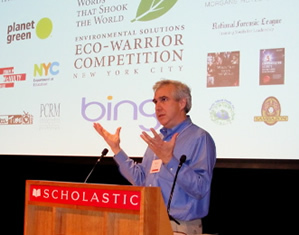 And, New York City teachers will be able to compete and win prizes in special speech and mentoring competitions as well. Welcome! You are about to improve your ability to do the scariest thing human beings ever do - stand up and give a speech. But, as you will learn, it doesn't have to be scary. ALL you have to do, to be a great speaker, and to WIN this competition and the Full Scholarship is to just reach inside and share what you are thinking and feeling. Don't worry about the form or the technique. Don't worry about never having given a speech before. Azah Awasum, the amazing winner of The 1st National competition, last year, had NEVER given a live speech before in her entire life . . . until she stepped out in front of the audience at the Finals in Washington, DC. ALL you have to do is SPEAK FROM YOUR HEART. That's what Martin Luther King did. That's what FDR and JFK and Barbara Jordan and Ronald Reagan did. And, when you learn how to do just that you will become a better communicator in your personal life, you will get better jobs, you will make more money and you will contribute to our country in even bigger ways. What's YOUR Message For America??? 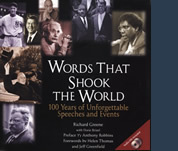 Words That Shook The World celebrates the great speakers of the past 100 years. This annual competition will help find and train the great speakers of the NEXT 100 years – Is it YOU?